The Couture Closet delivers the ultimate custom closet design to meet your needs, lifestyle and budget. Closet Designer Kathleen Jacobson and team create functional yet fabulous spaces for living an organized life. Whether it’s a luxury walk in master dressing area or a reach-in closet, our mission is to design your dream space, maximizing storage solutions while showcasing your wardrobe. It’s so much more than just a closet. Our Glide-Out shelf line offers a multitude of cabinet space saving options. We offer an extensive line of custom-built, Glide-Out shelves for all areas of your home. 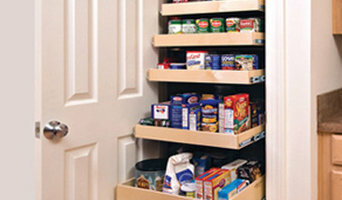 Whether you need Glide-Out shelves for your bathroom pantry, kitchen, home office, garage or any other room, we can design the custom Glide-Out shelf solution for your cabinet storage needs. We'll help you organize any room in your home by improving visibility and access to all of your stored items. 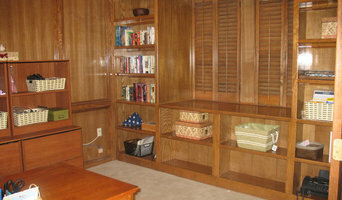 DFW Smart Spaces specializes in custom closets, garage storage systems, kitchen pantry cabinets, home office and more. We Are family owned and operated and look forward to designing your dream closet and garage space today! We guarantee to beat a written quote from any custom closet and garage organization company in the DFW Metroplex by 10%! We keep our cost low and pass the savings on to you, the customer! We know you work hard for your money and have many choices on where and how to spend it and we are glad you have chosen us to work with on your next project. Let's setup a time that works for you to meet in your Home and discuss your vision for your custom closet and/or garage organization project. I will show you what products and custom finishes we have available to help you envision what is possible to make your dream space a reality. Organization. Simplified. My business is committed to help the home or business owner improve their productivity by organizing their surroundings through de- cluttering, organizing and designing solutions to fit their particular needs. After years of working in the banking, real estate and investment industry, I realized that the key factor responsible for my success has always been my organizational skills. My ultimate goal while organizing is to create functional systems that simplify workflow at home and in businesses, as well as make the client stress free. On the first initial consultation, I make sure to ask the right questions to understand my clients wants, needs, and budget. From there, I am determined to think outside the box to create a beautiful space that my client can thoroughly enjoy. By the end of the project, client satisfaction is the most important. The most rewarding aspect of my job is witnessing the joy, peace and sense of relief my clients have after my work is complete. I take the time to teach each client how to maintain the organized space so they can spend more time with family and not spend all their time organizing their home! When the word "organizing" crosses your mind, I am here to help you achieve your "get organized" goals! With more than 10,000 storage and organization products in 16 lifestyle sections, The Container Store has the answer for any organizational challenge. Their complete solutions can help you create more space in any room and give you more time to enjoy an organized life. At Closets by Design we work to simplify your life. We design, build and install custom closets, garage cabinets, home offices, laundries, pantries, wardrobe mirror doors and much more. With a wide selection of finishes, accessories and hardware, you will get the customized look you have always dreamt of. Since 1982, we've built a reputation of integrity as the industry leader in customer service and total customer satisfaction. From our no obligation in-home consultation, custom tailored designs and the highest quality product construction, our products simply offer the best value in the industry. Organization: I offer "clinic-care," "urgent-care," or "emergency-care" to victims of clutter and chaos! I am here to render aid to busy individuals and families alike. As a member of the National Association of Productivity & Organizing Professionals, I work alone or with my team to customize solutions for an array of organizational challenges. I also work to equip clients with organizational skills for lasting success. Though I feel it is my ultimate goal to never have a repeat client, I am happy to act as "family-care" organizer when regular maintenance is requested. Staging: I enjoy giving homes a marketable impression that is both orderly and appealing to the eye. A home that is presented in a way that allows its full potential to shine through ensures that the seller gets the most return on his or her investment and the buyer doesn’t miss out on a dream-home for lack of imagination! It’s incredibly rewarding to help boost a property’s resale value to ensure each party gets what they deserve! I love organizing as much as I love helping people find their style. The end result is so gratifying & uplifting! It’s why I became a Professional Organizer. My degree from Baylor University is Apparel Merchandising because it combines the creativeness of fashion with the orderliness of organizing. The best of both worlds. Both my internship & retail experience at Neiman Marcus Dallas & Boston respectively built upon my education in fashion. At Saks Fifth Avenue, I jumped from Receptionist to the CFO’s Executive Assistant because of my professionalism & organizational skills. Always going above & beyond the jobs boundaries to find ways to make the systems run smoother. Refining systems, creating order & teaching that to new employees - on top of my standard responsibilities - became a theme with each new job. For years, friends and family have utilized my skills in their home: fitting both spouse’s clothes (neatly) into one closet, bringing children on board with chores, turning overloaded garages into workable spaces, carving out a Drop & Go Zone for mail and items leaving the home, tweaking home decor, and bringing life to wardrobes. I even had one friend call me before attending a wedding to settle a dispute about what would be appropriate for her husband to wear. In 2009, I launched Styled & Organized Living, a business that offers practical organizing ideas for your home, image consulting & home staging. I enjoy helping people take back their space while fine-tuning their image all with stylish solutions because Life is Better Organized! Professional organization, space-planning, turn-key relocation. I am a home space expert and coach. I empower individuals to take control of their home environment. By decluttering, organizing, and designing their home space, I help people live more productive, joyful lives. Your home should propel you to be your best self and to accomplish your life goals. There are many reasons why any of us arrives at a place of clutter and disorganization in our lives. No matter what those reasons might be, I can help you understand what brought you to that place and show you the way out. I will invite you to look at your belongings, your routines, and your environment in a different way, so you can reclaim your space, and enjoy your home again. I will design organization systems to fit your style and the way you live. In the process, you will learn the skills to make these systems part of your life. Your home should be a comfortable place where you enjoy family and proudly entertain friends. Let us help you achieve that goal. Maristella Bertram, MBA, CPO, owner of My Space Reclaimed, LLC, is a Board-Certified Professional Organizer, Redesigner and Stager. My Space Reclaimed: Uncluttered. Organized. Designed. I founded Angelynn's Jewelry Organizers in 1991 with a lot of hope, ambition and expectations. I have done my very best to utilize simplicity, function along with innovation. Deciding to only use sustainable materials I have created and managed every aspect of the manufacturing and the design process - end to end - with the highest standards being dedicated to the well being of people and the planet. My jewelry organizers are my very own copyrighted and trademarked designs. The are beautiful and durable and great for home, retail or commercial use. Created for women, teens and girls of all ages. My very first product was the Polycarbonate Acrylic Earring Angel Pierced Earring & Body Jewelry Organizer. Then I designed my first jewelry tree (necklace holder). Months later, I designed the Table Top Earring Angel and then more earring holder, jewelry tree and jewelry organizer designs were created and developed. My Multi-Purpose Earring Angel is a pierced earring holder, necklace rack and jewelry organizer all in one. It is the cre'me de la cre'me of jewelry organization and there is so much more to come. I have always loved being creative. In high school I took welding, jewelry making, pottery, photography and art. Skills I never knew that would come in handy to create my own business. Discovering how to weld, design scale, function and aesthetics were important lessons learned. Angelynn's Jewelry Organizers are an American Original! 100% Made in the USA using recycled and reclaimed carbon steel and polycarbonate. Angelynn's and its manufacturing shop partners made of Skilled American Tradesmen are a small part of the future of the Handmade in the United States product market. Our jewelry organizers may cost quite a bit more than other jewelry racks and organizers but that is because it costs quite a bit more to make them by hand here in the US. But I look at it this way; it is an investment into America the land I love; and I believe the quality of product we produce is worth the price and they will last a lifetime with proper use. For more than three decades California Closets has built a reputation on delivering truly custom products and unparalleled service to people like you. We’ve helped transform spaces, enhanced homes and allowed people to get more out of life. And as we move forward, we’re passionate about continuing to do all that and more. We see home as more than a place. We see it as comfort and refuge, space for connection and celebration. Everything we do is designed to enhance home and help you enjoy the time you spend there. 30 years ago, we innovated a new industry—custom designed and installed storage. Today we’re proud to be recognized as the leaders in the industry we first created all those years ago. Along the way we’ve continued to innovate, always striving to provide customers with stylish, smart and sustainable solutions for every home. We began by focusing on our customer’s needs and three decades later, nothing has changed. Your satisfaction remains our most important goal. We’re committed to listening to your needs, working hand-in-hand and never forgetting that it’s a true privilege to be invited into your home, and your life. Bringing harmony to your home by taking you from cluttered to calm. Before hiring a professional organizer, consider exactly what you need. Have you just moved into a Roanoke, TX home and have no idea where to put everything? You may want to consider an organizer who specializes in room-by-room space planning or estate organization. Perhaps you’re faced with a tiny closet and an overflowing wardrobe. In that case find a professional who focuses on closets to help you get back on track. Also consider the types of objects that need organization. Are they items like books, family photos, files or collections? You’ll want a professional organizer who has experience designing custom systems with Roanoke, TX companies that will best fit your needs. Find a professional closet and home organizer on Houzz. Narrow your search in the Professionals section on Houzz to Roanoke, TX closets and home organization.